I remember the first time I saw this quote. It really spoke to me at the time. 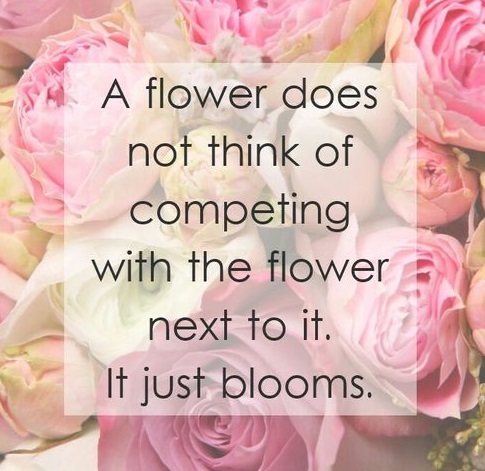 What a beautiful reminder to stop competing with others, stop comparing yourself to others, and just be you, as you are meant to be. I know this can be easier said than done, but when we can accomplish this, the world is filled with a bouquet of blooms. We’ve all worked with people who are competitive. They constantly monitor other people’s behavior, noting any weaknesses or failures, taking score. It’s exhausting. I have worked in places where everyone is like this, and I ran as quickly as I could from those jobs. Now that I’m older, I notice this competitive behavior a lot easier than I used to. When I was younger, and still very much acting out my Leo tendencies without much thought of the consequences, it was so easy to get swept up into the picking apart of others. The thing is, though, when you’re busy looking at other people and what they’re doing, it’s impossible to see yourself and what you’re doing. I found, time and again, whenever I was heavy into this kind of competition – all in my brain, of course, not really happening in the real world – I always made mistakes. Maybe I had a string of days I couldn’t get to work on time. Or I forgot to write something important down, and it was missed. Or I simply acted superior, when my work was not. I was so busy critiquing others that my own performance slipped. Experiencing that sinking feeling of having made a mistake and being exposed really caught my attention. This is one of the reasons I decided I needed to come to terms with my tendencies and get those obnoxious traits in check. It was too easy for me to get bossy. It was too easy for me to be critical. It was too easy for me to showboat. Of course, any astrological sign can succumb to these behaviors, but if you’ve ever met a Leo, you know it comes all too naturally for us. We are great in a lot of ways, but we can be really obnoxious! 😉 I have put a lot of energy into my own personal growth, and I think the best thing I’ve ever done is gain control of my reactions and reign in those impulses. Do you know what else a flower doesn’t do before it blooms? Worry about what yesterday’s bloom looked like. We all change and grow and become better people through self-awareness and a simple desire to be the best we can. It doesn’t matter who I was 30 years ago, 15 years ago, 5 minutes ago. What matters is who I am right now, what I’m choosing for myself in this moment, as each moment comes to me. I’ve done my share of things for which I am ashamed. I was young, I was reactive, I did stuff I wouldn’t do now. But I can’t change that blossom. All I can do is try my best to be the prettiest flower I can be today. There’s no point in holding on to what my bloom looked like a year ago because I can be different now if I choose. Whether you’re focusing on other people or your past self, realize that you’re focused on something you can’t change. Those choices have been made and you have no influence. What you can do is decide that your bloom today is going to be the prettiest bloom yet. What makes you bloom the brightest? How do you keep your focus on your own garden and away from others’? As always, I love to hear from you, so share your bouquet with me! Pretty correct suibdvision. I just came across your website and wanted to tell that I have actually enjoyed reading your opinions. AnyhowIâ€™ll be coming back and I hope you post once more soon.